BEAUFORT – Black Sheep restaurant was full of Tiller School fourth- and fifth-graders last week, buzzing with excitement to share what they learned earlier in the school year about marine debris and its hazards. The presentations and artwork lining the walls of the downtown restaurant were part of the NSF-funded, year-long interdisciplinary Duke University Marine Lab’s marine debris program. Tiller is one of six elementary schools in Carteret County that participated in the program this year. The fourth-graders each took a turn explaining to the roomful of parents, teachers and friends on May 8 during the DUML Community Science Marine Debris Art Exhibit how debris affects different marine animals. In addition to giving a spoken presentation, the students created posters about the marine animals they studied, which were on display in the restaurant. The fourth-graders also created two sizable pieces of work, a mural using the trash they collected as part of Track Your Trash, an activity in which the students kept track of the amount of trash they generated over a four-day period during the school day, and artwork made from trash collected during a cleanup at the Rachel Carson Reserve. Fifth-graders participating in the program created stop-action video public service announcements warning of the hazards of marine debris that were shown to the crowd after the fourth-graders presented. Fourth-graders Emma Robles in Allison Ketcham’s class and Skyler Bordeaux in Cristina Landis’ class were among the students who shared their research. Robles said one thing she learned is that when dolphins sleep, half of their brain is awake, while the other half is asleep. “If you see a bottlenose dolphin sleeping, one eye would be closed and one would be open,” she said. She also learned that sometimes the plastic that breaks down can get in the tissues of the bottlenose dolphin and it can spread to the calves through the breast milk and that can cause death. “I think people need to make sure that they don’t throw any trash in the ocean because it’s dangerous for the animals, specifically plastic,” she said. Bordeaux enjoyed the field trip the fourth-graders made to Rachel Carson Reserve, where they collected trash and then created art with it. She said she has learned about garbage patches, read articles about marine debris and learned about how long it takes for debris decompose. The project has made her more aware of how much trash is produced and now she picks up trash when she sees it. “They learned just how long different types of trash take to break down, the effects of it on oceanic life and how it impacts overall ecosystems. Most shocking was the part about plastic, that it never truly breaks down but becomes smaller and smaller, eventually turning into microplastics,” she said. During Track Your Trash, when the students collected the trash they generated during school hours for one week, they cleaned, sorted and counted the pieces of trash, and the results were shocking, Ketcham explained. “The students could not believe the amount of trash generated in only one week by one class. This realization was what influenced our decision to create our marine debris mural. All materials on the mural were from trash collected from the students during the week,” she added. 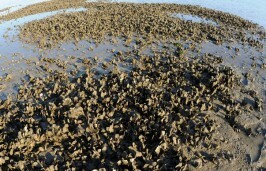 Ketcham said that as part of the research on marine animals, the students had to learn specifically how humans affect their existence with marine debris. They had to research physical and behavioral adaptations of the animals, the human impact component and any additional facts they found interesting. Fourth-grade teacher, Landis, explained that the fourth grade formed the partnership with Duke University Marine Lab last year as part of the school pilot program about marine debris. Landis said that she and Kelly Riley, previously a fourth-grade teacher now serving as the school’s director, attended a workshop last year led by Liz DeMattia, lead scientist for the Community Science Initiative at the marine lab, along with area teachers to share ideas and resources. “Our goal at Tiller was to create an integrated unit that stretched across fourth and fifth grades that empowered the voices of our students to make a positive change in the community,” she said. Landis added that when this school year began, Tiller’s fourth- and fifth-grade teachers began meeting to figure out how to make this a meaningful project that would extend over two years without becoming stale or repetitive. “I reread one of my favorite quotes by Maya Angelou and the structure of our units came to me, ‘Do the best you can until you know better, then when you know better, do better,’” which she said inspired the project’s goals. The fourth-grade students would be responsible for “knowing better” by becoming experts on the problem of marine debris, Landis explained, while the fifth-graders would build on this knowledge and “do better” by taking on a larger role, becoming experts and advocates for solutions to this problem. She added that it was an important lesson about the power of integrated studies as well because the students were able to go so much deeper when all their subjects — math, English language arts, social studies, science, art and technology — came together during this project. 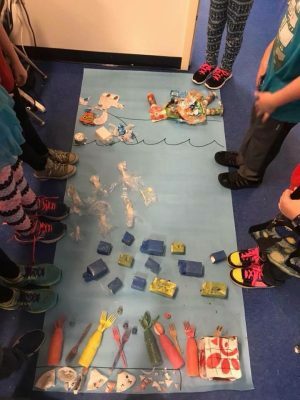 Through this project, Landis said the students read nonfiction articles about how debris impacts the ecosystem, which includes reading skills and science content, used math skills to make predictions about how much trash they would generate after Track Your Trash, used artistic skills to create the mural out of this trash, and learned important research and writing skills when they investigated their marine animal. Students also created a display with Tiller’s art teacher out of the trash collected during the beach cleanup field trip with DeMattia. They had the chance to practice public speaking skills when presenting their research at Black Sheep. Fifth-grade teacher Kimberly Wade said her students have had so much fun researching marine debris, creating video scripts and art work and making stop gap animation videos with the Community Science team from Duke. “Watching them use critical thinking skills and become more engaged through technology and innovation has been an incredible experience,” she said. 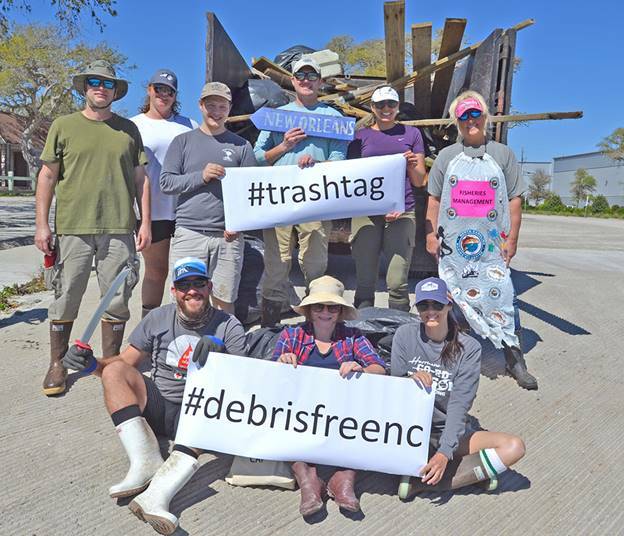 DeMattia, who has been working with Tiller School and other fourth- and fifth-grade students across Carteret County on this marine debris program, said the event at Black Sheep last week went great. 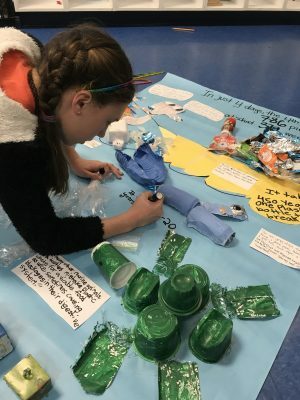 “We had so many kids expressing their thoughts on plastic pollution and marine debris and showcasing their research and art,” she added that parents were excited to see the research posters, public service videos, marine debris sculpture and poems. The students were proud to have a platform within the community to tell their story. DUML Community Science Initiative was founded in the spring of last year with a mission to increase meaningful opportunities for area schools, the public and the marine lab to engage through public participation in research, she said. 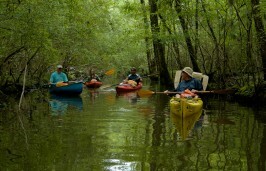 In the past year, programs on water quality and on marine debris were designed. “The ideas for the activities and topics in the marine debris program were developed during a Vision Workshop in April 2017 and piloted with two fourth-grade classes and at the Fishing4Plastics tournament at the North Carolina Maritime Museum in Beaufort in June of 2017. 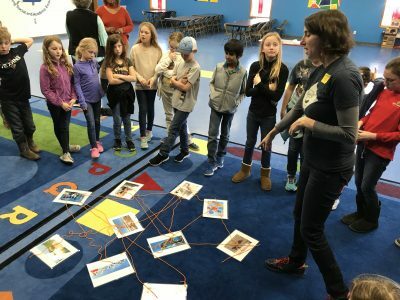 “We used feedback from these events, worked with local educators and developed a yearlong community science program that links fourth- and fifth-grade students with real world scientists and allows students to collect scientific data on marine debris and explore their findings through art, literature, technology, math and science activities,” she said. 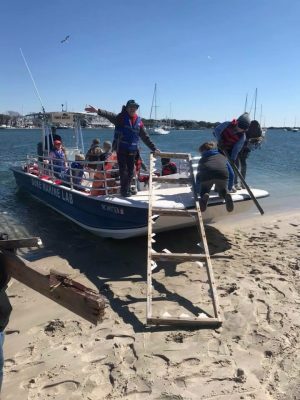 There have been 574 students from 33 classes and six schools that have participated in the program and have removed 3,949 pounds of marine debris from the Rachel Carson Reserve and Radio Island. Along with Tiller School, nine classes at Morehead Elementary, six at White Oak Elementary, four at Beaufort Elementary and one class at St. Egbert’s Catholic School participated in the program this year with four classes at Bogue Sound Elementary participating in a modified version because of the weather. There were also four classes total at Tiller but two did a modified version because they were the pilot last year. DeMattia said the reception to the program has been positive because teachers appreciate that the program is interdisciplinary and hands-on, while the students enjoy getting into the field and making a difference in their community. DeMattia is working with other schools and venues to showcase their art. Though Black Sheep was the first marine debris art exhibit, she hopes it isn’t the last. 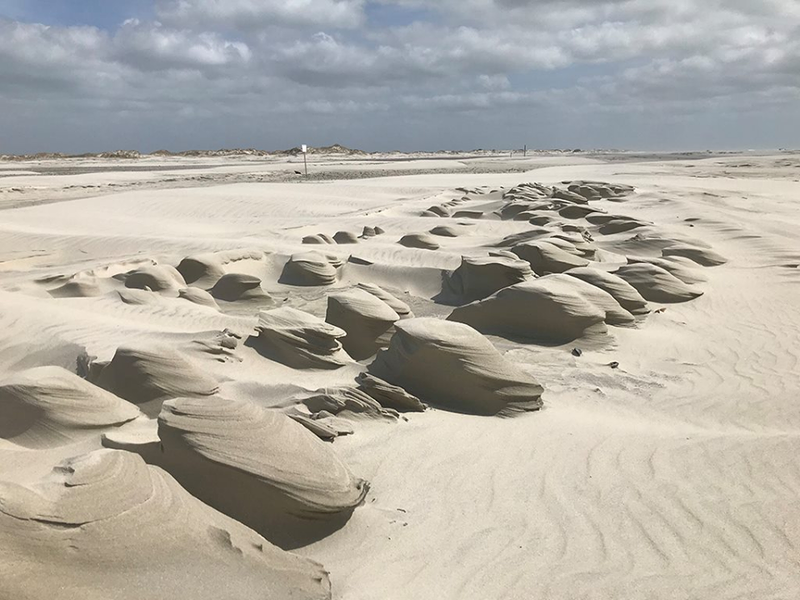 Fourth- and fifth-grade teachers in Carteret County are encouraged to participate in the marine debris teacher training workshop June 25-26 at the Duke University Marine Lab, DeMattia said.